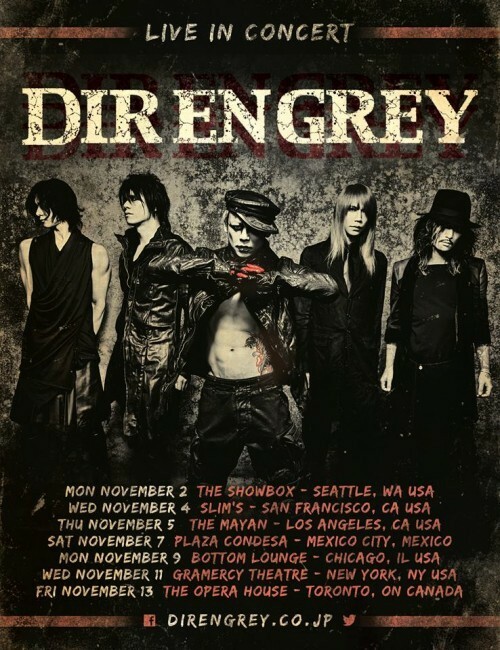 On Wednesday night, after ten years of listening to DIR EN GREY, I finally saw them live as part of their TOUR15 NEVER FREE FROM THE AWAKENING! They've actually performed in San Francisco about eight times in the past ten years, but due to various reasons (school in the early years, then lack of interest until the release of their latest album ARCHE last year), I managed to miss every time. But no longer! They were /phenomenal/. Tonight, I went to see Misty Boyce, Jay Stolar, Charlene Kaye, and Alexz Johnson at Brick and Mortar Music Hall in San Francisco with sanau_du and Doc Ray. The venue was one of the smallest I'd ever been in, which was great. I love the intimacy of small venues. We hit the merch booth before the show started. The drummer, Dave Heilman, was manning the booth, which included t-shirts, posters (designed by Charlene! ), and CDs from each of the artists, as well as a Charlene Kaye tote bag with a note from Charlene stuck on it that said that anybody who bought the bag would get a doodle from Charlene of whatever they wanted. (She'd offered the same last year at Apocalyptour, which I attended with Doc Ray, but the two of us didn't want to deal with the hoards of Starkid fans at that concert, which is part of why, as much as we both like Starkid, we were so glad she was back in SF without Starkid.) Doc Ray bought a Charlene Kaye tote bag and Charlene's three albums, and I bought the tote bag, Animal Love Remixes (having previously bought Animal Love already), and Misty Boyce's For the Grace of Odd EP. Since the four artists are all fairly unknown (though I've seen Alexz Johnson on a fanmix or two), the three of us managed to be front and center, along with group of other Charlene fans. Doc Ray ended up swing dancing with one of them for a bit as people trickled into the venue. All four artists were amazing. It was a fantastic night. (The Burger King stop we made afterward didn't hurt.) All of these artists are on Spotify, but I will link here to their official websites and, for Misty and Charlene, a couple of my favorite songs on YouTube, as well. Misty Boyce - "Dutch Girls" & "Regrets"
I DON'T KNOW HOW TO WORDS I'M SO OVERWHELMED. The StarKid show at the Nob Hill Masonic Center in San Francisco was definitely the lolziest concert I've ever attended and will probably prove one of the most memorable. Because StarKid, what are you. Watch StarKid's musicals on their YouTube channel! Sample Charlene Kaye's music on her website! edit: Videos of the show are up on the Apocalyptour Videos Tumblr! The ones anyone besides me might care about are bolded. December 2008 - Fremont MSJ Charity Concert - Social Stereo, The Ritards, Joe Jr.